Being a good-sized guy, it's sometimes hard to find an outdoor pair of shorts and shirt that fit right. Clothing can get especially uncomfortable when kayaking or doing water sports where you may end up wet. 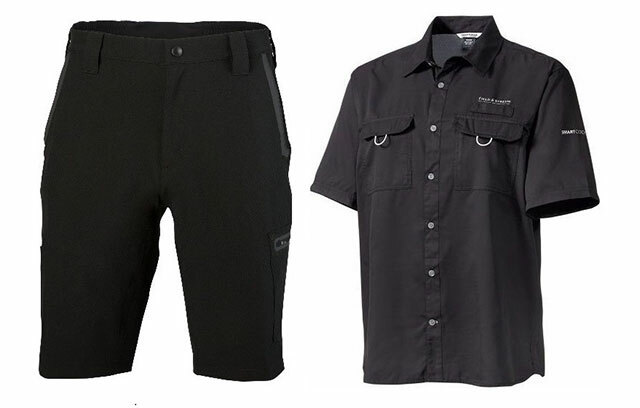 This summer; however, it seems I have found outerwear that made the cut for me: Field & Stream Men's Tidal Shorts and Latitude Shirt. The Tidal Shorts are made from 90-percent polyester and 10-percent spandex, which allowed me to sit in my kayak for hours and never feel as though they were tight or cutting into me. They also feature HydroRepel technology that repels mist and light rain in wet conditions. While I was sitting in my kayak, it began to lightly rain and I noticed the shorts were actually repelling the light rain. The shorts have not four, but six nicely located pockets for keeping all of your items close by and handy. In the left pocket, it was really cool to find a microfiber cloth for cleaning my sunglasses too. They snap in the front and the snap is very secure. No fighting with re snapping your shorts and a zippered fly that has not separated. It also has five belt loops that secured my belt well and like a lot of outdoor clothing, the shorts include UPF 50+ sun protection. Now for the Latitude Shirt. The shirt, like the shorts, are UPF 50+ and have SmartCool technology, which works by wicking away moisture to help keep you dry and cool. I did find the shirt to wick moisture, but not the best I have had at keeping me "cool". Not to say it didn't help. The mesh-lined backing definitely aids in the cooling process. The shirt has three pockets, two flapped and one-zippered pocket. The pockets are handy and of good size. If you get the long sleeve version, the sleeves can be rolled up easily and have a snap tab to hold them up. For a regular fitting shirt, I found it very comfortable and easy to move around in while paddling the kayak or casting the rod. The shirt never bunched up or felt tight. The colors available are Bermuda, Black, Bright White, Cerulean, Deep Lichen Green, Elfin Yellow, Horizon Blue, Skydiver, Stone, and Yellow. There are a nice selection of colors for the summer fishing months. I have tried outerwear from other outdoor stores and they were fine. Now that I have worn the new Field & Stream Tidal Shorts and Latitude Shirt though, I definitely found a pair I love to wear when outside, whether I am fishing, kayaking or just running around. For more information, please visit www.fieldandstreamshop.com.